Another endearing bit of silliness. I like teh silly, what can I say? I also love sarcastic robots. When I was a kid, my life's ambitionw as to own K.I.T.T. from Knight Rider. I adored that car. It was black, it was sleek, it was sarcastic. I thought by the year 2000 I'd have either a flying car or a smart-mouthed talking car, but noooo, science had to disappoint me on both those fronts. Honestly, CW, if you're looking for a show to replace Smallville, go with these two. I love Skeets. Who wouldn't want a little know-it-all robot following you around and telling you how awsome you are? I'd take him over a flying car any day. K.I.T.T was teh awesome, wasn't it? Flying cars? Someone DEFINITELY dropped the ball on that one - we don't even have a hundred hover-crafts in the lower skies. verification word is norse...um...Should I be reading Thor? K.I.T.T. should definitely exist by now. I'm sure science is at least capable of that. There is just something about a snarky robot. 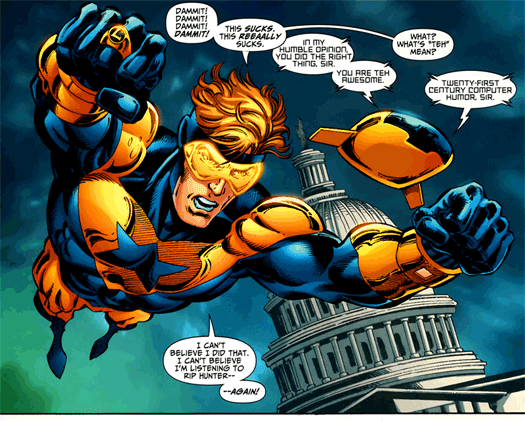 I still miss L-Ron something fierce...but Skeets is a worthy successor. I know! I miss L-Ron, too. He should come back. Read a Comic in Public Today! Who Knew Martians Were So Hypocritical? !